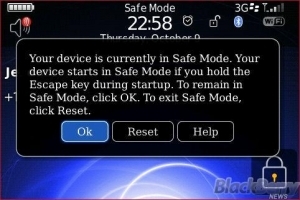 Safe mode comes to BlackBerry Bold OS | BlackBerry Blast! It looks like safe mode for the BlackBerry Bold is a reality. BlackBerryNews is reporting that the safe mode feature is indeed in the Bold OS 4.6.0.162. When you boot up your Bold you'll have the option to run safe mode which doesn't allow third party apps from running. It's a nice feature when trying to troubleshoot problems.